May 3 At the Statehouse: Keep It in the Ground! 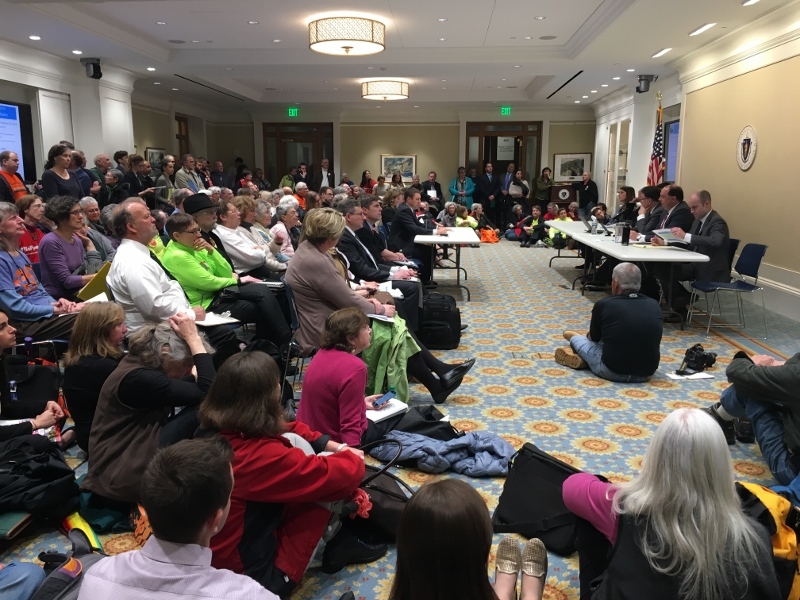 On May 3, several hundred climate activists from around the Commonwealth gathered at the Statehouse to show legislators strong support for policies that preserve a livable planet. The event opened with an inspiring rally, where activists heard of current struggles to stop pipeline projects still underway and what it will take to put the final nail in the NED coffin. Even though Northeast Energy Direct is suspended, three proposals in the eastern part of the state are moving ahead despite strong opposition: Spectra Algonquin Incremental Market; Spectra Atlantic Bridge; and Access Northeast, proposed by Spectra, National Grid, and Eversource. In Berkshire County, Kinder Morgan’s Connecticut Expansion would cut through an area including the Otis State Forest, despite violation of the MA constitution’s Article 97. Speakers included community activists describing on-the-ground organizing efforts, as well as statewide leaders explaining strategies to build a unified movement. Although it was raining, spirits were with kept high with singing led by Rev. Fred Small and free pizza for all, along with the thought-provoking presentations. After the rally, activists entered the Statehouse with two missions. First, to witness the Senate Global Warming and Climate Change Committee hearing called to address the impact of natural gas pipelines. The Commonwealth committed to reducing global warming emissions in the 2008 Global Warming Solutions Act (GWSA), and this hearing focused on the question, “how will new pipelines and increased reliance on natural gas impact our ability to meet these mandates?” Second, to meet with Valley legislators and their staffs regarding climate change legislation. Mass Power Forward, a grassroots network of 150 organizations, led the lobbying by developing and distributing a position paper advocating six policies to guide Omnibus Energy Bill currently being considered by the House: Oppose New Gas Infrastructure; Support Offshore Wind; Support Solar; Double the Renewable Portfolio Standard Rate of Increase; Improve Siting Requirements for New Transmission Projects; and Support Communities with Retiring Power Plants. Activists also lobbied on behalf of Divestment, Fair Carbon Pricing, and Green Bank legislation. The hearing was quite a remarkable event. Activists filled the room to overflowing, with many sitting on the floor and lining the walls. The flow of presentations was designed to provide a rigorous review and critique of the “business as usual” strategy proposed by Gov. Baker. This became apparent with the first two questions directed to the opening speaker, Energy and Environmental Affairs Secretary Matthew Beaton. First, Sen. Pacheco asked why Massachusetts was not taking the progressive regulatory path taken by its sister state New York, where the Public Utilities Commission takes policies protecting the states environment (analogous to the Commonwealth’s Article 97) fully into account in their pipeline decisions. Sen. Pacheco also questioned why the MA Department of Public Utilities doesn’t consider the Commonwealth’s GWSA goals in its decision-making. Second, Sen. Eldridge asked politely but insistently about the full-cycle impacts of natural gas on global warming emissions. The review and critique continued to unfold over the next three hours with detailed testimony by Attorney General Maura Healy’s staff; a former U.S. Assistant Secretary of Energy who now advises Northeast Energy Solutions; the Conservation Law Foundation; and the Union of Concerned Scientists. Backed by solid research and impeccable logic, the presenters hammered home the conclusion that the Commonwealth and its citizens will be far better off making a rapid transition to renewables without significant dependence on natural gas. For example, Rebecca Tepper, energy division chief with the office of Attorney General, provided details regarding the feasibility of increasing efficiency through conservation programs and dealing with winter peaks through investment in modern clean power generation. And the Senate panel signaled its skepticism about efforts to increase electric utility rates to charge for pipeline construction when Sen. Pacheco described the meeting as “an oversight hearing so the ratepayers aren’t taken to the cleaners.” Throughout the hearing, all the panelists – Senators Pacheco, Eldridge, Barrett, and Downing – skillfully questioned presenters to bring out the most critical points favoring renewables while pointing to the problems inherent in a strategy that relies on fossil fuel dependence.